It reminded me that I had taken a photo of Doug beside an actual palace guard at St. James Palace when we went to London in 2003- before we had kids. I had to go dig it up (it was taken on a non-digital camera -gasp!- but, luckily, I got it on disk). Doug was doing his best “I’m not gonna smile either” face. 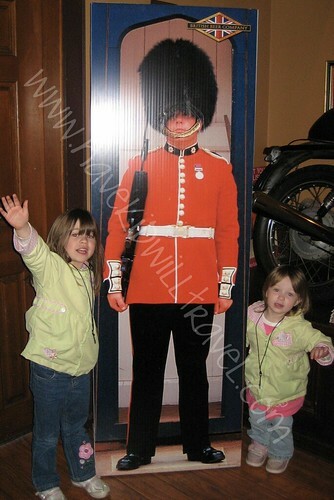 Unfortunately the cardboard guy is the closest the girls will get to an actual palace guard until they are older. We decided no big cities until they can appreciate the museums. I don’t want to repeat the sprint through the Museum of Archeological History in Dublin.